Leonardo Drew, “Number 35S” and “Number 33S”, 2014, wood. Courtesy of Anthony Meier Fine Arts. Ongoing through August 1st – Leonardo Drew at Anthony Meier Fine Arts: Featuring new works by New York based artist Leonardo Drew that are composed entirely from wood in a variety of scale and form. The sculptures juxtapose white with black, clean lines with raw edges, and organic forms with organized grid lines. Gallery hours are Tuesday – Friday from 10:00 am – 5:00 pm. Anthony Meier Fine Arts is located at 1969 California St, San Francisco. Clockwise from top left: Laura Owens + Joseph Alef ‘Untitled (2014)’, Trisha Donnelly + John Mullins ‘Untitled (2014)’, Nate Lowman + William Scott ‘Untitled (2014)’ and Anne Collier + Barry Regan ‘Untitled (2014)’. Courtesy of Creative Growth. July 9th – A Project for Creative Growth’s 40th Anniversary, 6:00 PM : For Creative Growth’s 40th Anniversary, artists Anne Collier, Trisha Donnelly, Chris Johanson, Nate Lowman and Laura Owens were invited by curator Matthew Higgs to create limited edition screenprints. 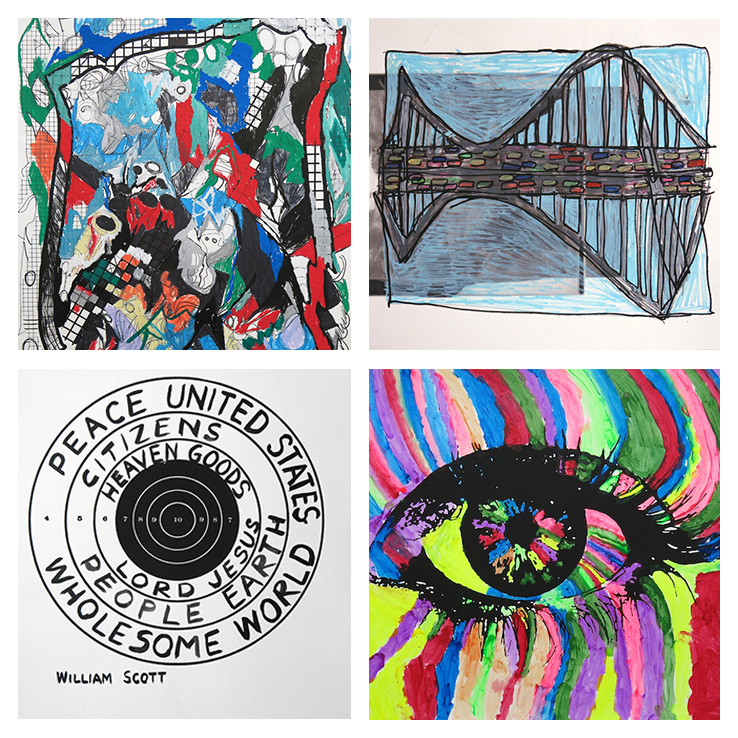 These screenprints were then further worked on by over 100 Creative Growth artists to create new works that will be on view and for sale at the fundraiser. Funds raised go to support Creative Growth, an art center serving adult artists with developmental, mental and physical disabilities by providing a professional studio environment for artistic development, gallery exhibition and representation and a social atmosphere among peers. Tickets begin at $100 and can be purchased here. Creative Growth is located at 355 24th St, Oakland. 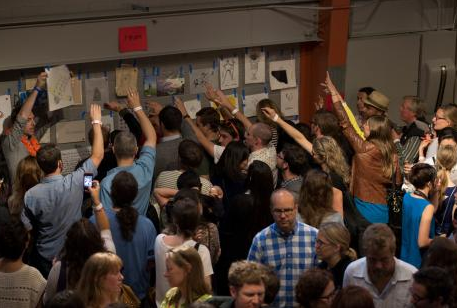 Attendees of the 2013 Monster Drawing Rally line up to purchase completed artwork. Courtesy of Southern Exposure. July 11th – Southern Exposure’s Annual Monster Drawing Rally, 6:00 PM: Over 120 artists will work side by side at this exciting live drawing and fundraising event. Viewers will be able to watch artists work and all pieces will be on sale at the rally for $60. Music, dancing and curbside food will accompany the live drawing for a fun filled evening. Funds raised go to support Southern Exposure, an artist-centered non-profit organization committed to supporting visual artists. Tickets are $15 for Southern Exposure Members, $20 for the public and will be sold at the door. The Monster Drawing Rally will be located at the Verdi Club, 2424 Mariposa St, San Francisco. 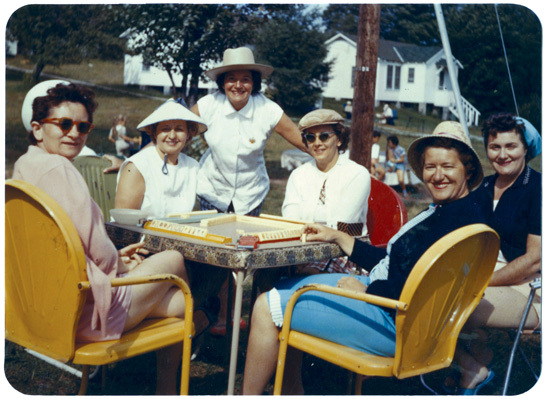 Women playing mah jongg in the Catskills, c. 1960, courtesy of the Contemporary Jewish Museum. July 13th – October 28th – Project Mah Jongg at the Contemporary Jewish Museum: Project Mah Jongg uses this historic game as a lens to look at the connection between Jewish and Chinese culture and its impact on identity, fashion and style, including artifacts such as scorecards, aprons, packages, tiles. As part of the exhibition, every third Thursday the museum will host Jews for Dim Sum, where artist Imin Yeh and Blue Bottle pastry chef Leah Rosenberg will share stories as they roll out a limited edition screen printed mah jongg snack box, find out more details here. Museum hours are Friday – Tuesday from 11:00 am–5:00 pm and Thursdays from 11:00 am–8:00pm. The Contemporary Jewish Museum is located at 736 Mission Street, San Francisco. Fog Beast. Courtesy of Bay Area Now and Jessica Swanson. July 18th – October 5th – Bay Area Now 7 at Yerba Buena Center for the Arts: The YBCA will be hosting the latest version of Bay Area Now, a triennal art exhibition. This year, instead of individual artists, YBCA is featuring 15 Bay Area arts organizations who will be curating site-specific projects throughout the galleries and campus. For tickets, information and a full list of programming and events click here. Regular YBCA hours are Thursday – Saturday from 12:00–8:00 pm and Sunday from 12:00–6:00 pm. 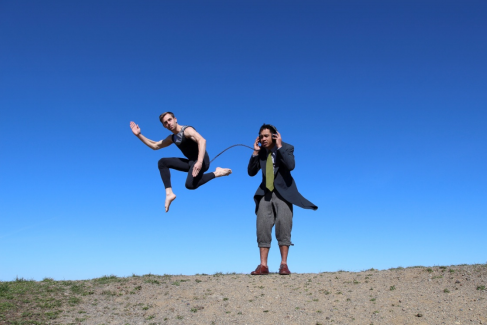 An opening night party will be held Friday, July 18 from 8:00-11:00 PM in the YBCA Grand Lobby. Yerba Buena Center for the Arts is located at 701 Mission St, San Francisco.